The wall between our world and that of vengeful spirits has protected humanity for more than 400 years. It's about to come crashing down. Ellie Lancaster has lived her whole life by the site of the mysterious Lost Colony of Roanoke, the Virginia settlement that vanished without a trace around 1590. Ellie is a Curse Keeper, the direct descendant of one of the two men who banished the spirits of a warring tribe from the material realm. The story goes that if the two Curse Keepers ever meet again, the countdown to the death of the curse will begin, the gate will open, and the raging Native American spirits will be unleashed to seek their revenge. Ellie has always taken the legend for a harmless fairy tale. 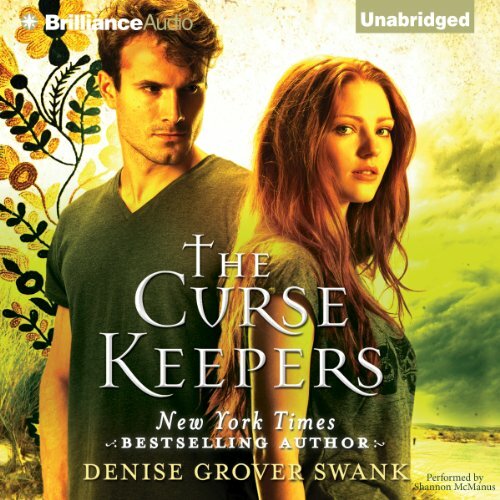 Until she meets the darkly handsome, but downright infuriating, Collin Dailey and realizes that he is the other Curse Keeper. The prophecy is coming true. Now Ellie and Collin must battle supernatural forces and their loathing - and passion - for each other to set things right. ©2013 Denise Grover Swank (P)2013 Brilliance Audio, all rights reserved. I felt like a lot of the curse words were unnecessary. To me, it took interest away from the story. The story was very good and the preformance was great but way too many f _ _ _ s inserted. Would have been much better with out it. wow. I wasn't not expecting this to be good. I loved it. I first downloaded this book thinking it would be a good book to keep me entertained while I wait at the doctors office or before bed...but I was hooked! It had a few cheese moments but it's very fast moving. I couldn't put it down. 1. I got to listen to in through Kindle Unlimited for free, i.e. I didn't have to pay for this. 2. I listened to it rather than read it so I mostly avoided any grammatical errors that I might have focused on instead of the story. This book had so much promise in the beginning. The introduction of the characters, the setting, the mythology are all the reasons why I picked up the book in the first place. Then, the author seems to have given up and just gone through every romance and soft core erotica written since the seventies and used every single cliché in and out of the book. The characters do not grow with the experience. They only wobble about in their contrived scenes. Ellie goes from responsible, boring, predictable to sexually driven waif in less than two chapters. I skimmed through reviews on Amazon before listening, and got excited about the originality. After listening, I skimmed through the more discerning reviews on Goodreads, and found several mirroring my exact thoughts: good idea, bad execution. You'll like it if you've never, ever read a romance before and everything is new and scintillating. You'll like it if all you read are old romances. You'll like it if you skim through the contrived scenes and focus on the fictional mythology. You won't like it if your tastes are a bit more demanding, if you understand that the changes in character come slowly as people learn, if at all. The beginning could of been stronger. That it actually turned out good. I about gave up in the beginning because it seem like a young reader kind of book. This book starts off seeming like a young teen read and grows into something way more than that. Stick with the book through the rough start because it gets much better. At times this book is heavy on the foal language. The story is actually pretty decent about to start the second book. I loved the story. Kept me enthralled from the beginning. Stayed up most of the night listening to the ending. I just LOVE both Ellie and Collin!! I absolutely love this book. The story is based off a curse and it unfolds shortly after starting the book. I love all of the characters in this book. If you are hesistant to try this book, please don’t! It is well written, each character is amazing in their own right, and you will finish this book rather quickly!! Truly amazing book!! Did I mention that I LOVE Collin? Yea, you’ll want to meet him!! I absolutely loved this book! How authors can have such creative minds to make these characters, story lines, and put them together in such an amazing way is mind blowing! I really liked the story and the idea. Narrator was great. But I could not get over the weak main character. She was not very likeabke. She was very slow to figure things out (like dumb) and wined repeatedly about the same things. If she was really supposed to save the world, then we would be doomed. She was doing her laundry the last day???? Priorities.... Ugh I really wanted to like it but I won't be reading the next ones. The book started out promising but then got fairly predictable. Also, I didn't love the narrater's voice.